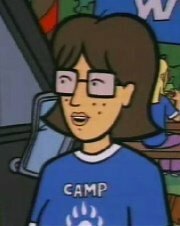 Amelia is a teenager at Camp Grizzly in the episode, "Camp Fear" and Daria Morgendorffer's only known fan/follower. Freckled Amelia is taller than Daria and of stockier build, with dark bangs parted in the middle and dark glasses with square frames. She was voiced by Sarah Drew, the voice of Stacy. 1 Amelia in "Camp Fear"
Amelia saw herself and Daria as having a lot in common. In fact, the main reason Amelia came to the reunion was so that she could meet Daria again. 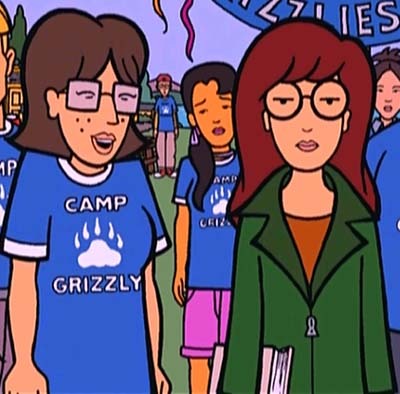 Whereas Daria only came to Grizzly the once, Amelia went for an unknown number of years (she says "since I've been coming to this camp") and loathed it. She idolized Daria as the ultimate rebel, though many of Daria's "rebellious" acts during her stay at Camp Grizzly could be explained through either bad luck or Daria being ostracised. She's stunned when Daria reveals the truth behind some events - she didn't boycott the End-of-Summer campfire but wasn't invited - but in other cases, like Daria's horse running off and tossing her, Amelia had known the truth at the time but somehow remembered it as Daria being cool. Amelia's adoration of Daria is so great that when Jane refers to Amelia as "Daria having a secret fan club," Amelia takes the statement literally and assumes that Daria has an actual fan club. In Amelia's imagination, both she and Daria are examples of independent people "not following the crowd"... or at least she wanted to be an independent person that didn't follow the crowd. She later admits that she always did what people like Skip Stevens told her to do, whether she wanted to do it or not, out of fear of social rejection. When Daria tells Amelia that she doesn't have to follow Skip's planned agenda for the Camp Grizzly reunion, Amelia tells Daria that she wants to hang out with her. Daria tires of Amelia's clinginess and points out that Amelia has done nothing but follow Daria around since her arrival. Daria tells Amelia that she not only doesn't want to follow a crowd around, she doesn't want to gather a crowd, either. She suggests Amelia go practice being an individual somewhere else. Amelia angrily turns against Daria, telling her she's learned the truth: Daria doesn't like anybody. During Skip's final speech to the campers, Daria comes over to the table where Amelia is sitting alone and makes a sarcastic comment about Skip's speech to ease the tension between them. This prompts Amelia to leave and interrupt Skip's speech with a speech of her own. She criticizes Skip for always talking and never listening to anyone, and says that she had been following Skip against her better judgment. Amelia tells the crowd that the only reason she returned to Camp Grizzly was to meet Daria, her "role model" and "inspiration." She notes that even though Daria is an unpleasant person (her opinion of Daria has clearly changed), Daria follows no one's marching orders. From now on, Amelia will do the same, even if it leaves her a friendless and unpleasant outcast just like Daria. She ends by stating she will never return to Camp Grizzly. Amelia's heartfelt speech is greeted with the campers' cheers, and they pelt Skip with their Camp Grizzly T-shirts in Amelia's support. Before Daria leaves the camp, she and Amelia are partially reconciled. Amelia hopes that her speech didn't hurt Daria's feelings, but Daria commends the speech for its truthfulness. Elsewhere, Skip Stevens complains on the ride home with Quinn that Amelia is the "worst camper ever" who "doesn't even try to sing" and "never won anything." There is some debate among fans of the series (without supporting evidence) that Amelia was meant to be an archetype for Daria's real-life fans in general: slavishly following her every move, misunderstanding her intentions, pretending to be just like her, etc.). The meeting between Daria and Amelia, according to this line of thought, was meant to be a cautionary tale, showing how Daria would actually react to discovering she had fans. And perhaps a poke at fans to keep their perspective (just a cartoon, after all). No one knows the answer here. One wonders whether Amelia's final rebellion wasn't just another way of imitating her personal idol and not part of a true emotional breakthrough. If Daria dislikes everyone, Amelia figures she can dislike everyone, too. The issue is left unresolved, though it is worth noting that before Daria leaves Amelia makes sure things between her and Daria are patched up. (And didn't Daria make an effort to be reconciled with Amelia before the latter's outburst at Skip? And wouldn't that open the door to Amelia doing the same with Daria?) If Amelia had been serious about her adoption of Daria's attitude, she would not have cared what Daria thought. It has also been speculated that "Camp Fear," which featured an unusual number of character clones, was using Amelia as a pseudo-Jane Lane (but an unsuccessful one). Amelia tells off Skip Stevens in "Camp Fear"
After 2011, Amelia has often been given the fanon surname "Pine" after it was first used in the Worldburner crossover - a version of Amelia served as a comically bumbling Ringbearer. Amelia is not often used in Daria fanfiction, but fanfiction has occasionally addressed the issue of whether Amelia could possibly have been friends with Daria under any circumstances. An adult Amelia, now a county sheriff in Montana and Daria's real best friend, appears in the post-canon story "Darkness," by The Angst Guy; and in an alternate-universe tale by TAG, "After the End," he also showed Amelia becoming Daria's best friend after Jane Lane dumps Daria for good when the romantic triangle with Tom Sloane develops. Ms. Hand has Amelia become Daria's friend in college in the post-canon tale, "Not Exactly." She becomes Daria's friend in AU fic "Grove Hell on Earth" and its sequel by Charles RB, but Daria only approaches her out of sheer desperation (and had never liked her before). Other fans have been less optimistic. Kristen Bealer has often pointed out the selective and unrealistic way Amelia looks at Daria and their relationship, constantly missing cues correcting her false perceptions. "Country Wisdom" encapsulates this view perfectly as it turns out Amelia was told by Skip that Daria didn't want to come and was too passive to ask Daria herself, to the young girl's contempt. "John Lane 41: Friends and Rediscovery," by Richard Lobinske, makes a similar point and adds a startling twist as well. In "Prisoner of Hope", TAG did depict a depressed Amelia shortly after the end of "Camp Fear," when she realized Daria could not be her friend after all - in this case putting the onus on Daria rather than Amelia. A few genderswap stories have Amelia and a male version of Daria, turning her infatuation into a crush. J-D's "Not So Different" had 'Sonny' Morgendorffer take mild pleasure in crushing her dream by revealing he's gay. Smijey's "Rio Grizzly", where Darius is a stereotypical 'cowboy' type, ends with the two paired off. Bealer's "Camped Out" takes a similar turn as Trent goes to the camp reunion instead of Daria and Amelia fixates on him. And then there's the JoeMerl untitled story working off an Iron Chef prompt, where instead of Daria, Amelia starts following around a pre-teen Anthony DeMartino! Outside of her obsessions with Daria, Amelia also appears as a first- or second-rank character in a number of alternate-universe fanfics with science-fiction, fantasy, and adventure themes. These include Greystar's "Daria AE"; Galen Hardesty's "Blood Oath of Patriots II", where Amelia is a secret agent; and the shared world sci-fi Amelia Pine, a recurring figure in the Worldburner/Worldhopper part of the Judith stories. In the post-canon Mystik Spiral story "Ow, My Ears! The Mystik Spiral Story" by Charles RB, Amelia becomes the band's drummer after Max Tyler departs. Amelia is one of the characters that was the least depicted in Daria fan art. Her first depiction was one where She was a costumed superhero type working for Sick, Sad World, from DJW's Steel Jaguar God Battler Oxidiser X series in the mid-2000s. (Her superpower was to turn invisible when nervous.) The image, by DJW, has rarely been seen. Until now. Amelia has also been depicted twice in Dariarotica by Wouter Jaegers one time in a stand alone piece where she's depicted enjoying herself at a tree overlooking Camp Grizzly and in the unfinished story "The Camp we used to fear" in which she takes over the role as camp leader from Mr. Potts. "The Camp we used to fear" by Wouter Jaegers, unfinished. This page was last edited on 27 May 2018, at 18:18.